Head coach Grant Bradburn insists Majid Haq still has a Scotland future, despite saying the spinner was "deemed unselectable" for the World T20. Haq, 33, has not represented his country in more than a year since being sent home from the World Cup following a controversial tweet. "Majid set his own parameters for playing international cricket and didn't meet them," said Bradburn. "The door has never been closed and that remains the case." Haq is Scotland's all-time leading wicket-taker and most-capped player with 209 appearances. He reacted angrily to being omitted from the side during the World Cup and suggested on Twitter that the decision was race-related, deleting the post soon after it was made. "It's not a forbidden subject or a negative at all," Bradburn told BBC Scotland when asked about Haq's continued absence. "First of all, our spin department is strong at the moment. We're satisfied with the progress of our youngsters. "Mark Watt has embraced every challenge thrown at him, Michael Leask and the not-so-young Con de Lange have made valuable contributions. "We also have three or four in the under-19s, who are very promising. Our spin stocks are strong." In June, Cricket Scotland announced that Haq was clear to resume his international career but the Clydesdale player has yet to be recalled. "Cricket Scotland have supported Majid and will continue to do so," added Bradburn. "The big question for everyone is will he play again? "That decision rests firmly with Majid. "My own opinion is that the whole situation is incredibly sad. There have been no winners. "I hope he has the drive to meet his own standards. To keep pace with the demands for international cricket." Bradburn described his World T20 experience as "bittersweet", following elimination from the qualifying round with one victory from three matches. 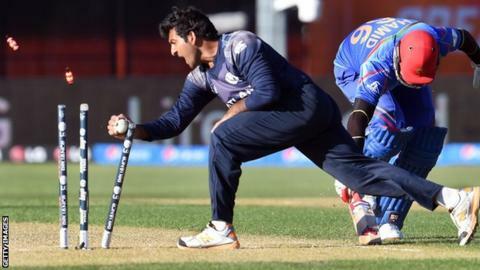 Following defeats to Afghanistan and Zimbabwe, Scotland recorded their first win in 21 attempts at a major global tournament in a rain-affected contest with Hong Kong. "There are lots of emotions," said the New Zealander. "A sense of satisfaction from our first win. "But we know we didn't play well enough in key moments to earn the right to play some more cricket against full-member nations. "And then there's frustration after such a valuable experience and all the learning for the team that we have no high level cricket as a group until August." On the World T20 losses in India, Bradburn talked of "agonising fine lines", saying: "Both of the games were sitting there for us. "We recognise that we need to make more of those critical moments and a lack of experience at that level is probably the number one reason why we didn't manage it. "Against higher-ranked opposition, we lost by 14 runs and 11 runs - that's three boundaries. We could have found one of each in our fielding, batting and bowling. "But now we've got a win on the world stage and we're hoping to build on that."